Don Dunning, the man in charge of mulch operations for the entire GSMNP, carefully inserts a 30 lb bag of mulch into one of the volunteers bags to be transported three grueling miles, with a 1,000-foot elevation gain. A crew of volunteers met recently on a mild day. 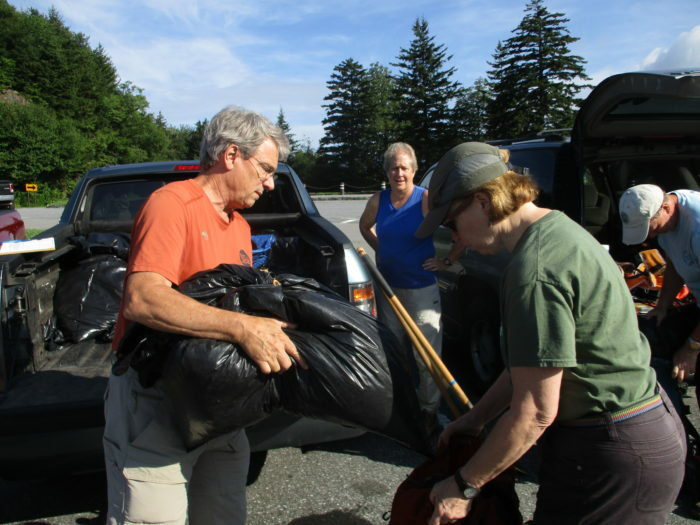 People from all walks of life—from employees at Oak Ridge National Labs, to blue collar workers, to teachers and retirees—gathered to fill their packs with special mulch, recycled from the husks of the thousands of dead Eastern Hemlocks that succumbed to infestation. In addition to this weight, we were carrying an assortment of rakes, shovels, axes, hoes, and swing blades, plus rain gear, food, and water… putting our packs at around 40 pounds. Our tallest member, a man approximately 6′ 7″ tall, asked to take two 30 lb. bags! When all was said and done, he probably had about 75 pounds of gear. When we started up the trail, the tall guy and the septuagenarian took off and left the rest of us in the dust. I, being a trail angel at heart, had tucked a 12 pound watermelon in my pack, plus a knife and cutting board for a pack weight of about 50 pounds. When we arrived at the shelter, dumping our heavy burdens into a storage locker, I noticed Mark had the telltale scars on his legs of knee surgery. He was very forthright when I asked him about it and he and his wife Janet told their story. Mark said it was Janet’s lifelong desire to hike the A.T. So, in 2008 they started section hiking the trail. Janet said that Mark came along for support. 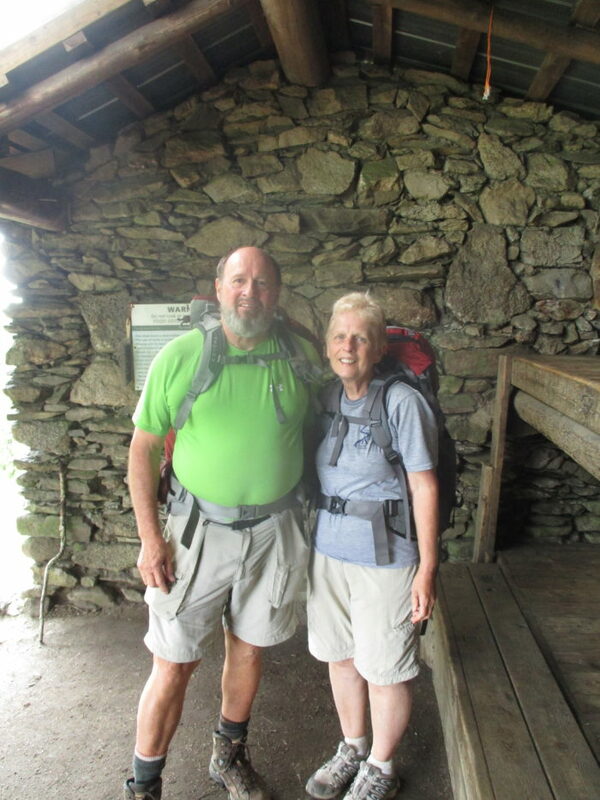 Later on the AT in 2009, she suffered a heart attack. She was taken to a hospital to discover her heart attack was unusual—Takotsubo Cardiomyopathy–and was triggered by the shock from an intestinal blockage. After recuperating from having two feet of her small intestine removed, they got back on the trail. But that wasn’t the end of their ailments. In 2011, Mark’s knees got so bad, he had to stop hiking. Mark, jokingly said, “My wife wore my knees out!” After having both knees replaced and a lot of physical therapy, they returned to the trail. They eventually completed all of the trail in 2013. 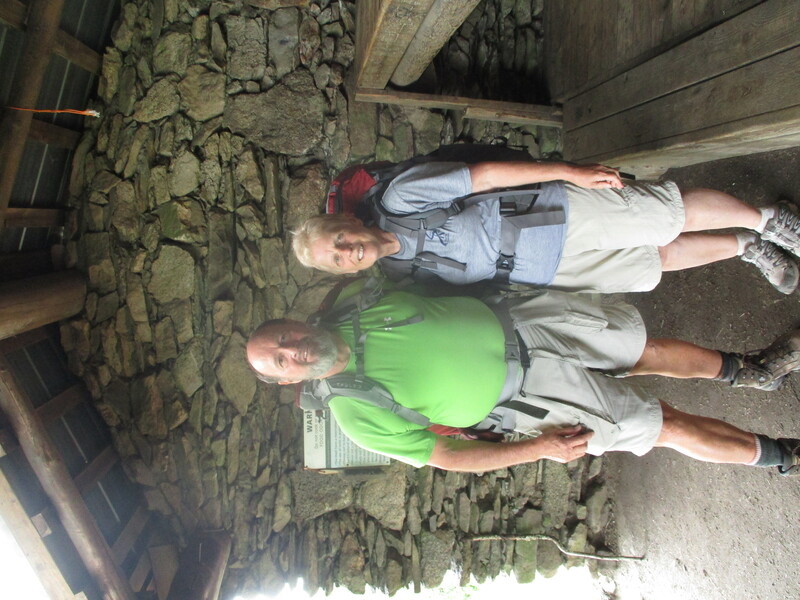 Since then, Mark, a retired assistant principal, and Janet, a retired teaching assistant to special needs children, have hiked all 900 miles of trail in the GSMP and are on their second go around. They come on A.T. work trips on a regular basis, as well as maintain their own section of trail somewhere else. They have lived and continue to live a life of service, not letting their age or disabilities slow them down. 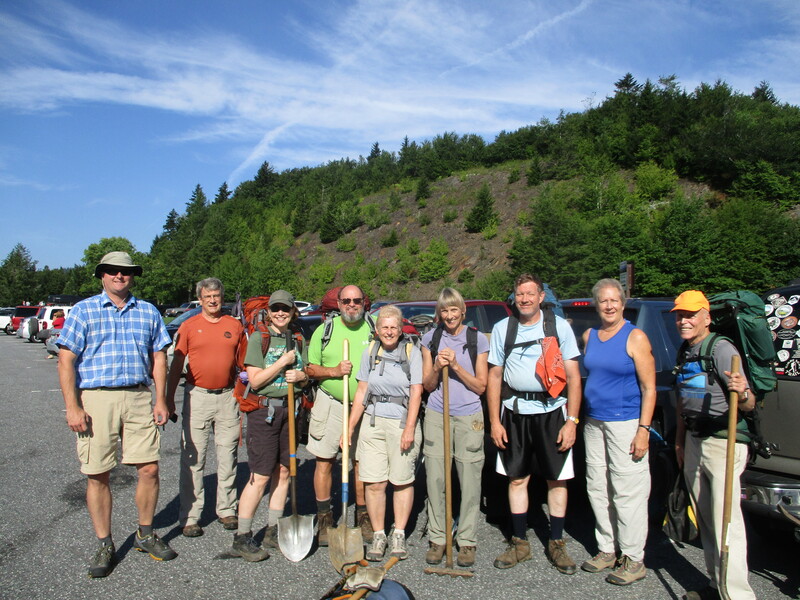 After chopping weeds, removing trees, and clearing drainages on the 3 miles back to our vehicles, we were rewarded with many, “Thank you” s from many hikers, receiving especially kind words from the though hikers. It was wearying 6 hours of work but we all left with a sense of well being in a job well done, and the peace of mind knowing that we made a small difference on a very large trail. Thank you to all who volunteer! I am hoping to start a thru hike in 2018 and have seen little of the trail (other than u-tube videos) and what i have seen is taken care of. I would like to find out when trail maintenance is gonna be so i could maybe volunteer some time! And Thank you again! Dave, you can contact the Appalachian Trail Conservancy for a list of all the trail clubs up and down the trail and locate the club nearest you. Then, it is a simple matter of finding out when their next work trip is and meeting them for a rich, fulfilling day of doing something that matters.